An extremely rare Girard Perregaux Deep Diver Gyromatic ref 8867V circa 1960’s. Only roughly 400 of these gorgeous divers were made, making it quite a rare find, particularly in this pristine condition. Featuring a stainless steel 38.5mm case with screw down back, and wide rotating black acrylic bezel. The watch also features the correct, and original, non screw down “GP” signed crown. Featuring a beautiful condition original matte dial with painted tritium hour markers and slender luminous matchstick hands. The 6, 9, and 12 dial markers feature a very eccentric, stylized font. 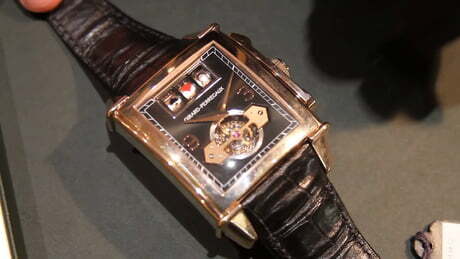 Powered by self winding movement with date. Just fully serviced and left in original minty, unpolished condition and offered with our 1 year warranty of accurate timekeeping and operation. Also accompanying your purchase is one of our beautiful handmade Italian leather watch travel pouches, a $45 value!